Lyapunov - Transcendental Etude Op. 11 No. 1 "Berceuse"
Among the winners of the 2013 American Protégé International Competition of Romantic Music, pianist Joshua Ross recently made his Carnegie Hall debut in Weill Recital Hall in February 2014 and will return to Carnegie this June. He holds a Master of Music degree in Piano Performance from the University of Georgia, where he studied with Dr. Martha Thomas, and a Bachelor of Music degree in Piano Performance from The Florida State University, where he studied with Dr. Heidi Louise Williams. He also studied with Dr. James Nalley, performed and studied at the 2008 Schlern Music Festival, in Vols am Schlern, Italy, and has played in master classes for renowned pianists Angela Cheng, Natsuki Fukasawa, David Northington, and Richard Cionco, among others. 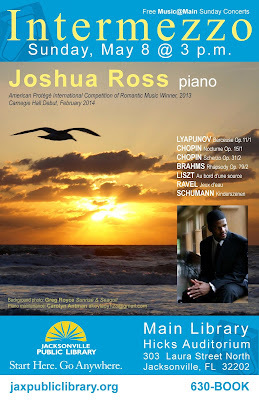 Among recent engagements, Mr. Ross performed for the Steinway Piano Society of Bonita Springs in their Past Winners Recital Series, as well as the 2013 American Bandmasters Association conference in Tampa, Florida as featured pianist with the internationally-acclaimed University of Georgia Wind Ensemble. Recent competition performances include the 2012 Georgia Music Teachers Association National Competition as well as the UGA concerto competition. Pursuing his passion for teaching, Joshua was on the faculty of the UGA Community Music School, where a gave private and group piano lessons to both children and adults. He currently teaches at the Steinway Piano Gallery of Bonita Springs, Florida. Originally from Naples, Florida, Joshua is a devoted alumni of the FSU Marching Chiefs, in which he played the saxophone, enjoying many high-profile engagements including the 2010 Chick-fil-A Bowl in Atlanta, and the 2011 Inauguration of Governor Rick Scott.